So after years of delay the new tunnel under Selborne Road, leading from Walthamstow Central to the bus station, is open. And as you might expect, it's crap. Unbelievably there is no escalator - just zillions of steps, over three flights. Ah, but there is a lift. Needless to say its opening has been delayed but when it does start working the lift will take 5-6 people. Pathetic. The contempt which Transport for London has for public transport users is astonishing. Meanwhile the cycle stands by the drop-off layby remain fenced off, for no very obvious reason. And the 10-years-overdue footpath between Walthamstow Central and Queens Road station remains unbuilt. And Walthamstow Central station itself is crap. 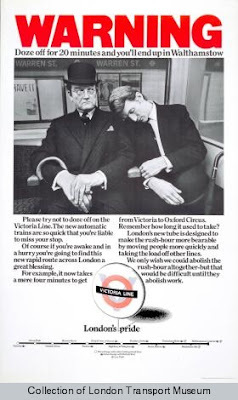 No single queueing system on the Selborne Road side, permanently understaffed, and the ticket office closing down early every night in order to save on staff wages and maximize profits for the shareholders. The new issue of wfm has more bogus 'road safety' propaganda, this time splashed across the front page. It involves a 'collision reconstruction' stunt staged at Chingford fire station for the benefit of pupils at Chingford Foundation School. 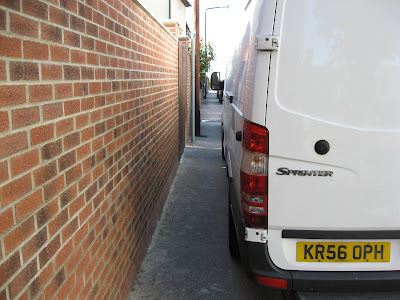 Councillor Bob Belam (the man who believes in transferring motor vehicles to previously unparked-on pavements, thereby increasing vehicle speeds as well as degrading the walking environment) said, "We want to keep young people safe and this scheme is one way of doing this." No it doesn't. Publicity stunts are meaningless and everyone who participates in them colludes with road danger, rather than addressing the key issues of vehicles designed to flout the maximum national speed limit and widespread driver contempt for basic road traffic law, which results from low penalties and a culture of reluctant, minimalist enforcement by the police. 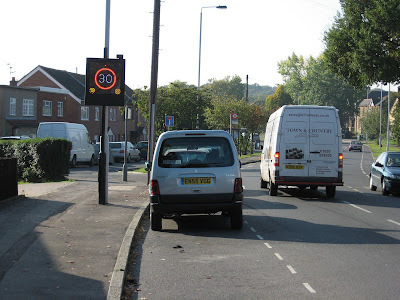 The most effective thing the Borough could do to make the roads safe for young people would be to install speed cameras on all the roads where currently solar powered speed signs flash all day long, registering the daily indifference of tens of thousands of drivers to obeying speed limits on our local streets. 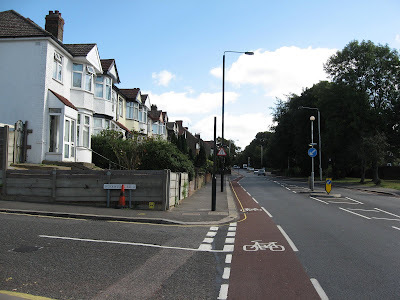 (The photograph below was taken on Larkshall Road, Chingford.) That would be just a start. 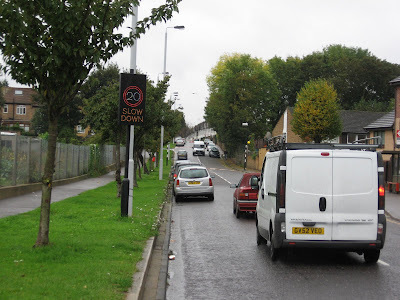 After that they could install speed cameras outside Chingford fire station, where vehicle speeds are clearly in excess of the speed limit. 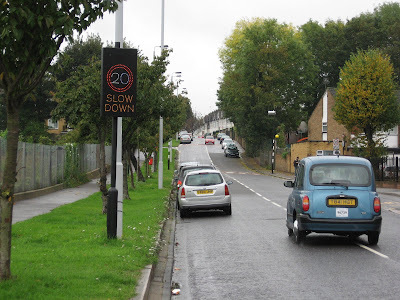 Non-compliance with the 20 mph zone on Hale End Road, where there are two schools and a zebra crossing, is 100 per cent. On page two of the current issue of the Council’s lavishly funded propaganda rag wfm – residents of the London Borough of Waltham Forest live in paradise, is the rag's fortnightly message – is the headline Spike helps children keep safe. Below it is a photograph which shows someone in a hedgehog suit leading three smiley kids from Holy Family school across a zebra crossing on Shernhall Street. (Look closely and you’ll see that the crossing’s white markings are all fading away – but no one at LBWF does irony.) Yes, Spike the Hedgehog ‘will be helping to teach school children to stay safe on the roads during the dark winter months’. It’s a fraud. It’s all about blaming the victims of driver crime and diverting attention from the source of the violence – killing machines which are manufactured to go at least twice the maximum national speed limit and drivers whose contempt for basic traffic law is signalled by reckless speeding, red light jumping and driving while talking on a handheld mobile (to name just three). Spike the Hedgehog is an initiative of the cyclist and pedestrian loathing Department of Transport. The government’s road safety strategy is useless. Instead of the bogus ideology of ‘road safety’ what pedestrians and cyclists need is danger reduction. There are now three times more cars than children in the UK says a report commissioned by Play England. The disappearance of places where children can play demands a "robust and urgent response", says the report. The report calls for a hotline to identify anti-social adults who obstruct children from playing outside. "With cars outnumbering children by three to one, the acceleration of house building, and the privatisation of public space, places once used by young people for playing and exploring rites of childhood are quickly being swallowed up," says the report's co-author, Celia Hannon. Can you spot the cycle stands? Can you spot the two cycle stands in this photograph? They are cleverly concealed by a shopkeeper who obviously resents cyclists using them. They were like this today. They've been like this repeatedly, for months. Westbury Road E17, on the corner with the High Street. 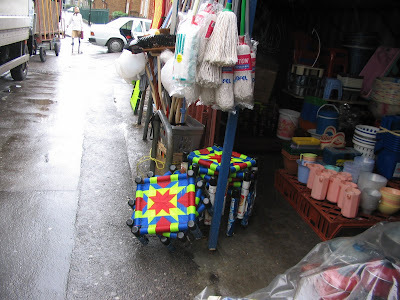 And although the Council is aware there's a problem with the regular and widespread obstruction of cycle stands by shopkeepers and market traders, it is signally failing to deal with it. 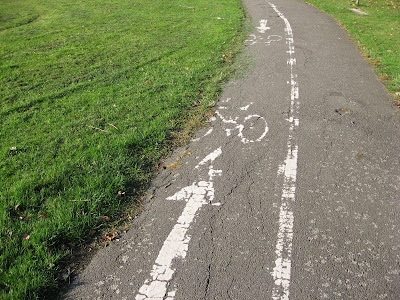 The cycle lane in Larkswood Playing Field, Chingford. Two arrows and cycle logos meet head on. Cyclists collide here - is that what it means? Naturally the markings are faded and the cycle lane surface is cracked and crumbling. And anyway no sane cyclist comes on this out-of-the-way crap cycle route anyway - if you do you get chased by fierce dogs. Forest Road at the junction with Woodstock Road in upper Walthamstow. See that enigmatic black pole on the corner? It used to support a solar-powered speed sign, which flashed all day long as drivers raced through this residential area at lawless speeds. A couple of years ago the sign vanished and the pole has been there ever since. You'd think someone in this crap Council would have ensured that the sign (presumably removed for maintenance or repair) was put back as soon as possible. 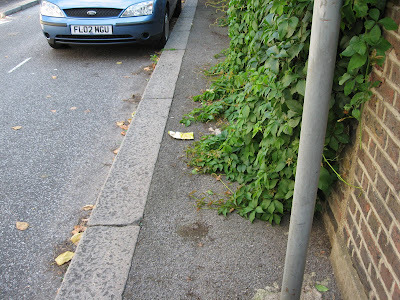 But that's 'road safety' for you - as neglected in this Borough as everything else. It's crap of course because its action plan is completely contradictory to what is actually happening in the Borough. 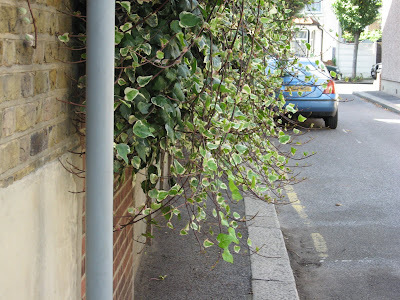 Take Melford Road and Woodville Road E17, for example. These two parallel streets started to have problems when wide vehicles were parked opposite each other. The refuse lorry couldn't squeeze between the vehicles. So the local ward councillors came up with a brilliant solution - pavement parking! In other words, don't deal with the problem of drivers who obstruct the carriageway by stupidly parking one wide vehicle opposite another one. Instead, dump the vehicles on the pavement. One furious resident who lives here has been banging off letters to the local paper saying she wouldn never have bought her house if she had known that the pavements were being converted to car parks. Typically, no one seems at all bothered by the blatant daily obstruction of the footway which already exists at this location. See below. Who could possibly deny that the London Borough of Waltham Forest is getting greener? 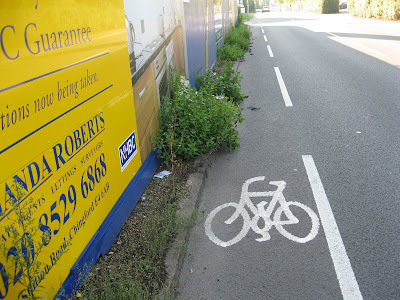 The cycle lane on the B160, Chingford. Not a good idea to leave the lane though, since the road goes downhill and motorists come belting down at 50 mph or so (yes, it is a 30 mph zone). 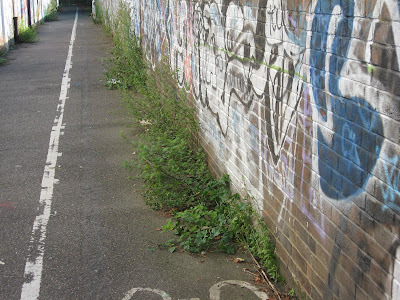 And the grisly cycle lane (on the right, below) besides Walthamstow Greyhound Stadium could do with some weeding too.